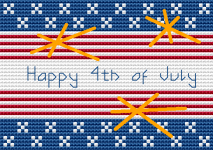 Patriotic cross stitch.Stylized flag with the text: Happy 4th of July. Patriotic design in red,white and blue with the text:"Happy Birthday America". 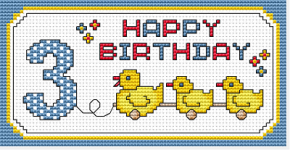 Cross stitch pattern celebrating morning tea! A composition of a teapot and a cup of tea with the text:"Good Morning"
Stylized tropical island with the text "Enjoy Your Summer"
Red carnations cross stitch pattern- the official state flower of Ohio. Is there a connection between stitching and cooking?A funny design with the text:"When I learned to stitch, I forgot how to cook". Funny cross stitch pattern on red Aida with the text: "New Year, New Beer". 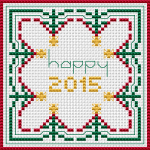 Cross stitch pattern for greeting cards or biscornu on white Aida. Abstract cross stitch pattern of an autumn tree in the shape of a hand. Cross stitch chart depicting a basket of roses, designed with just a few colors.